Neurons have varieties - each having unique structure and function. However, it has few common characteristics. Neurons all have dendrites, enabling receptions and also an axon for the conduction of the nerve pulse. All these types give support (functional and structural) to the other types. Together with neuroglia, they compose the basic cell structure in the CNS, or the central nervous system. They are uniquely designed to respond to chemical releases and stimuli in an appropriate manner. They are also responsible for the impulses and the chemical regulators being released for the brain. - Neurons aid these following activities: memory, thinking, organ and gland regulation. Without neurons or with the neurons degenerating, the brain’s function will be affected. It does not undergo mitoticular division but it generates by itself for recovery. - Neuroglia is the term coined for the support cells in the CNS. These are reproduced by limited mitotic division, however, they outnumber the neurons. They provide throughout the system general support. - Despite neurons having different shapes and sizes, they have only 3 basic components. The principle element, and the one components that is similar to other cells is the cell body. Inside it is a prominent and big nucleolus, and it is intended for the support of the nucleus. The major part of the cell body consists of the cytoplasm. - The one that aids protein synthesis is the chromotophilic substances. It looks like a layer of granules in the endoplasmic reticulum, and it also has minute microtubules. These are then responsible for the material transport in the cell. The endoplasmic reticulum on the other hand aids the action of the protein synthesis. Cells in the CNS are grouped together, calling it a nuclei, and they are also found in a ganglia. - Dendrites are the small branches that reach out from the cell. It helps determine which stimuli to respond to (for the cells). It also aids the impulse conduction in the cell body. It is covered with dendric spinules, too, thus giving contact to other neurons and adds to the cell body’s surface area. Meanwhile, dendritic zone is the term for the exclusive area of the dendrites within the cell. 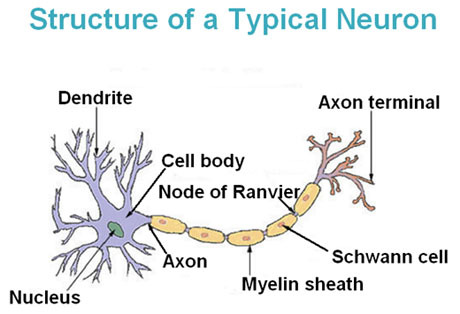 - The axon is the second type of plasmatic extension of the cell. It is similar to a dendrite- only elongated. Some say that its shape is similar to a finger, and it is responsible for the sending of impulses from the cell body. Its length primarily varies, and it depends on the function and the location of each. It could be as long as a meter, enough to cover specific areas in the spinal cord, and it could also be only for a few millimeters. The axon has collateral branches, and it reaches of the the side, extending to the outer part of the cell. Its cytoplasm consists of mitochondira, microtubules and neurofibrils. Collateral branches reach off to the side and extend out from the cell. The cytoplasm of axon is comprised of microtubules, mitochondria, and neurofibrils.